There has been a big furore over the past few weeks regarding the publication of the new, 13th Edition of the Times Comprehensive Atlas of the World. Specifically, the depiction of the Greenland Ice Sheet (GIS), and the associated press release, which said that the GIS had lost 15% of its permanent ice cover. Initially it was unclear where the “15%” figure had appeared from, but it soon emerged that the new map bared a striking resemblance to an online map of the GIS on the National Snow and Ice Data Centre’s website. 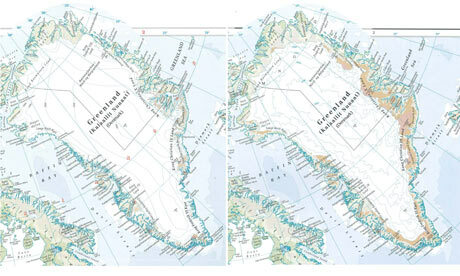 Those working on Greenland for the Times Atlas had clearly misinterpreted this map, and taken it to be an absolute measure of all ice cover in Greenland, when it actually represented something else. The reason that this cartographer’s error spiralled out of control is simple – scientists were not consulted. Had consultation taken place, the error on the map, and the consequent ice loss figure of 15% would have been immediately spotted and corrected. The error, if left uncorrected would have discredited what a number of scientists from institutions across American and Europe have been working on for a number of years. The actual picture of what is happening to the GIS is extremely complex, and remains poorly understood in areas. It is a story of variability, with extreme thinning and increased in melting in areas, counterpoised with slight thickening in other areas. The details are too complex to do justice in this post, but maybe another time…. The main issue that arose from this “crisis” was not the actual error made by the cartographers, this was relatively easily rectified in the end, but the ease at which this information got into the public domain with no input from scientific experts. Such experts, who have built their career working on monitoring changes of the GIS, are subject to the rigorous peer-review system when disseminating their work to the wider scientific community. The problem with this however, is that this information is largely only available to the academic community, whose institutions provide paid subscriptions to the content. ‘Scientific’ information reaching the public through popular media is subject to no such scrutiny and due to the far greater reach of such outlets, errors can propagate much further much more quickly. With recent “fiascos” tarnishing science’s reputation (Climategate, the IPCC), science needs all the help it can get to stay favouring in the public’s eyes. Thankfully this episode was resolved quickly, and if anything, demonstrated the ability of scientists to quash rumours with scientific evidence quickly. At no point did the writers think to contact any scientists over the alarmingly large 15% ice loss Greenland had experienced. Instead they simply put it to print and made a fool of themselves as a result. They have now agreed to work with scientists in the future to correct this issue, and ensure it doesn’t happen again. Hopefully this will be the standard position for those publishing material that should (and does) have a grounding in scientific work. For an interesting alternative visualisation of melting in Greenland visit Cryocity.